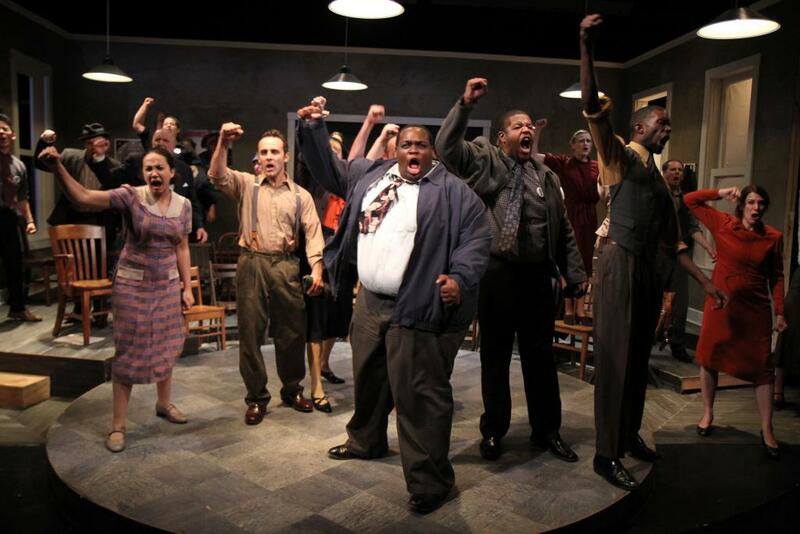 An article by Brandon Oliver about a 1935 play about workers intending to strike. I was recently pleasantly surprised to see that the local community college in Minneapolis was putting on Clifford Odets’ 1935 play, “Waiting for Lefty.” It turns out that it was also presented in London this year after a 30-year absence, so perhaps there is something in the play that speaks to the current moment. The Minneapolis production also took the admirable step of arranging contemporary union members or labor activists to speak after each performance. Normally, I don’t think that cultural review is the biggest priority for the Industrial Worker, but seeing the play live did start me thinking about some things that I think are important for our organization. First, I’ll give a little background on “Waiting for Lefty.” It seems like it was a pretty famous play in its time (supposedly, the first performance sparked a riot in Manhattan), but it seems to have faded from public knowledge. I wouldn’t have known anything about it before the performance, except that FW John O’Reilly recommended I read it last year. Odets sets the play up as a meeting of a taxi drivers’ union in New York City, with only one item on the agenda: a strike. Although I thought some of the characters had the depth of sock puppets, Odets pulled off a stroke of technical-political genius by having the play occur within a union meeting. There is no fourth wall to break as some of the cast members sit within the audience and sing “Solidarity Forever,” shout disagreements with the union boss, or get roughed up by goons. The plot is pretty simple. The union boss, Harry Fatt, addresses the talk of a strike and tries to reassure everyone that “now that we’ve got our boy in the White House, we can’t go out.” Of course, he would have supported a strike under the previous administration, but since “Roosevelt has our back, it’s our duty to have his.” With his armed goons behind him, he goes on to blast the “reds” in the union, saying that he’s coming for them. Members start shouting out for Lefty, the head of the strike committee, but he’s not there. The four other members come up to speak one by one, and each of them has a vignette explaining why they are in favor of striking now. Of the four, one is a doctor who was fired for being Jewish and another was a chemist who did not want to make poison gas. Although his attempt to tie in other parts of society might have made political sense in some ways, this effort detracts from the idea that this is a struggle being led by workers. It’s unlikely that half of the taxi drivers were declassed intellectuals, so why write half of their leaders to be? However, Odets did say later that he’d “never been near a strike” and wanted to use the strike story to discuss many of the problems with capitalist society. After the flashbacks, a union member bursts in to announce that Lefty’s been found—behind the dispatcher’s office with a bullet in his head. The strike committee, with the unanimous support of everyone but Fatt, declares that the strike will begin. Odets uses Lefty’s death to argue that we can’t wait for militant and charismatic leaders to come save us; we have to run our struggles ourselves. The play’s presentation as an actual union meeting proves to be its most interesting quality. As critics at the time pointed out, part of what was so engaging about the play for so many spectators was that it mirrored their experiences so well— coming to the union in search of a way to stand up to the bosses, seeing confrontations between entrenched bureaucrats and militant workers, and ending dynamically in either repression or some kind of victory. How many union members today would recognize their experiences in this play? From my own experience in a business union, I would guess the percentage is probably close to zero. If anything, people who have never had any experience with unions would probably be more likely to recognize the scenes as similar to what unions look like in movies and on TV. This is an important change to be conscious of, because, although unions look the same externally, they have lost their meaning in the years between 1935 and 2013. At one moment, even the most problematic unions were a battleground between militant workers and “labor fakirs,” as bureaucrats used to be called. In 1935 maybe it was still possible to kick out all the bosses like Fatt, tell the president not to wait up for us, and turn the unions around. However, 70 years of government collaboration and workplace contractualism has made them such dusty upholders of the status quo that it would take a more creative mind than Odets’ to imagine them leading or inspiring a new workers movement. A local officer of the American Postal Workers Union (APWU) spoke after the show and hammered the above point about the play home. While I was impressed that the cast reached out to labor and union activists, it quickly became clear that this one, at least, had more in common with boss Fatt than with Lefty. The resemblance began with the exhortations that our only weapon for stopping the privatization of the U.S. Postal Service (USPS) was to “write our congressperson.” Some audience and cast members asked why APWU wasn’t preparing for a strike and the speaker said that “it’s illegal.” The speaker then let slip that the USPS has casual employees and a twotier system, and after another Wobbly (and dual carder) that I was with pushed on it she confirmed that their union contract made these concessions. I’ve been an IWW for long enough that I thought I was pretty well inoculated against the business unions. However, hearing how anti-combative they are from their own representative is somehow much more powerful than hearing it from another Wobbly. The business unions aren’t just good unions gone bad; they are literally zombies— shells that appear to still be alive but with all of their internal dynamic and thought process gone, destroyed by repeated doses of the poison known as the National Labor Relations Act. Finally, they have become incapable of acting out of the bounds that their poisoners have set. We can’t “recapture” or replace them (that is, not at administering the contract). Our task has to be to show a different path, as a permanent fighting workers’ organization. We should also be visibly putting out our revolutionary message at events like this. Don’t get me wrong—between a branch that focuses on workplace organizing and one that focuses on outreach, I’ll take the organizing branch every day. However, as FW MK explains dialectics, there’s “what’s going on,” “what’s really going on,” and “what’s really, really going on,” which brings back the moment of truth from “what’s going on.” We can bring forward a powerful message as long as it’s rooted in experience of work and organizing, rather than pure ideology. We should become more intentional about bringing this message forward because we can’t become the organization we need to be if our only activity is organizing at our individual workplaces. The business unions don’t have any plan or desire to change the status quo, let alone rupture it. If we regain the confidence that our fellow workers had in the 1930s to proclaim publicly and loudly what we’re about and organize aggressively, then we can once again help to initiate a widespread fighting workers’ movement that brings the bosses—whether in the unions, government, or workplaces—to their knees. Lefty, the hero of the play was Sam Orner, a New York taxi-cab driver who, as a teenager in 1913, joined the Young People's Socialist League, the unofficial, leftist youth section of the reformist Socialist Party of America. After travelling all over the United States as an organizer for the Industrial Workers of the World, the “Wobblies”, Orner joined the Socialist Educational Society of New York, largely formed in 1921 by expatriate members of the SPGB, in 1923. The SESNY later became the New York Local of the Workers Socialist Party of the United States. In the early 1930s, Sam Orner became the organizer for the New York cab drivers. In 1934, they went on strike, and it was this strike and Orner's part in it that formed the subject of Clifford Odets's play. Orner fell foul of the Mafia mobsters who were attempting to get control of the union, the International Brotherhood of Teamsters. They badly beat him up, and he was hospitalized. But a comrade managed to get him out of the hospital before the mob could kill him. Sam Orner remained an active member of the WSP(US) until his death in 1973. Very interesting - thanks for adding that!